I was reading The Power of Coincidence and it mentioned the Nazca Lines in Peru and how Maria Reiche, a German mathematician, had devoted most of her life studying these lines. I finished reading and, for some reason, picked up Arthur C. Clarke's Mysterious World. It opened to page 189 where I read, "In the last 1940's, Kosok teamed up with Maria Reiche, a German mathematician and astronomer. She had come to Nazca to pursue a theory of Kosok's that the lines were astronomically aligned ..."
The same page went on to tell of how, "Kosok died in 1959, but Maria Reiche has devoted her life to the study of these lines, living rough in the desert, tracing new alignments and preserving them against the inroads of tourists." So in the world of coincidence one thing often leads on to another with the aid of synchronicity. And when I was looking for a photo to include on this post I searched on Google Images and the first one I clicked on was the one I have used. This turns out to have been released to the Public Domain by - yes, you've guessed - Maria Reiche. Good one! 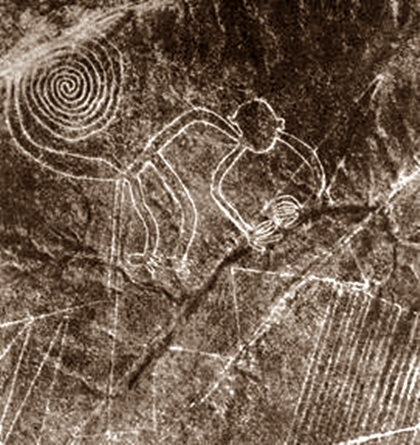 The Nazca lines are fascinating and mysterious, ready and waiting for synchros like this one! These absolutely fascinate me. That's quite the trick picking up a book that opens to a page on the same subject. How do you do it?? No idea how it happens, it just does, no conscious effort involved! Was This A Mothman Sighting?